AWC-SB will once again honor two women who have touched many local lives with their communication skills, one very publicly and the other in a quieter but no less powerful way. 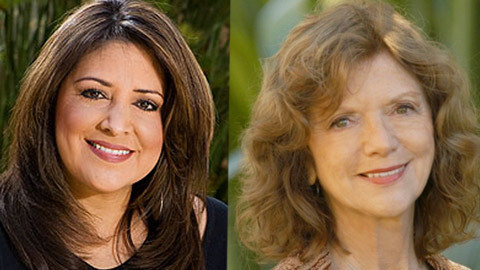 From Breaking News to Awakening the Muse is the theme for the 2012 Women of Achievement Awards, honoring award-winning anchorwoman Paula Lopez and poetry therapist Perie Longo. The honorees will be recognized at a celebratory luncheon on Wednesday, June 6, 11:30 am-1:30 pm, at the Hyatt Hotel. Paula Lopez, co-anchor KEY NEWS at 11 pm, began her television career in 1985 as an intern in Channel 3’s news department before heading to KCAL Channel 9 in Los Angeles in 1990. Paula anchored live gavel-to-gavel events of the O. J. Simpson murder trial, and continuous coverage of southland floods and the firestorms during 1993. One of her most challenging duties was reporting on the devastating Los Angeles riots continuously as the events unfolded. Best News Reporting Award from the Radio and Television News Directors’ Association of Northern California. Paula returned home to KEYT in 1996. She is a ninth generation Santa Barbaran and a direct descendant of Lt. Pablo Cota, one of the founding officers of the Royal Presidio in Santa Barbara. Perie Longo moved to Santa Barbara in 1969. She taught Speech and Communication, first at Santa Barbara City College and then for ten years at Brooks Institute. She found that she enjoyed helping others, as shy as she’d once been, to find their voice. About that time, she took her hobby of writing poetry to a more serious level and attended the SB Writers’ Conference, where she won two writing awards. She began teaching at the annual conference and through California-Poets-in-the-Schools, both programs she continues to be involved in to this day. Inspired by the ability of children to “find their voices” through writing poetry and be fearless in expressing their deepest feelings, she pursued her education and earned her PhD in Counseling Psychology. This led to her involvement with Poetry Therapy. She joined the National Association for Poetry Therapy and received their Outstanding Achievement Award in 1999 and their Outstanding Service Award in 2004. Perie has led poetry therapy groups at Sanctuary Psychiatric Centers and Hospice of Santa Barbara, always focusing on guiding others to find their unique voices and expressing them through poetry. Perie is Poet Laureate Emerita of Santa Barbara (2007-09). One of her most fascinating experiences in communications has been traveling to Kuwait in 2005 to speak on Poetry as a Path to Healing. Tickets for the event are $50 if purchased online before Saturday, June 2 or $60 at the door. Sponsorship opportunities are available and encouraged. Please contact Dr. Lynn K. Jones, AWC-SB President, at awcsb@hotmail.com, or 805/448-7681. This entry was posted in Past Events and tagged Paula Lopez, Perie Longo on May 8, 2012 by Lisa. Congratulations on your 2012 Women of Achievement Award. No one deserves it more!